A resident and native to Pike County Pennsylvania. Deborah A. Adams is a professional carver of wood, stone, and bone, specializing in heirloom, historical and nautical pieces. Deborah utilizes both power tools and 19th Century techniques to construct her unique visions and designs. Some items are to scale, exact replication, or simply through imagination. Prior to the carving process she carefully researches the historical aspects involved keeping in mind the piece's use, material, and purpose. 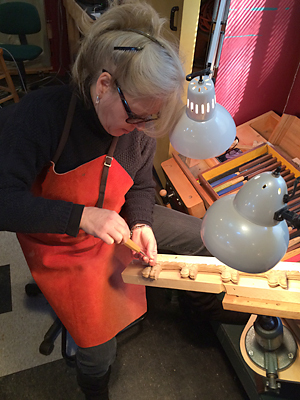 Deborah was an apprentice for the late Sal Polisi of Manhattan's South Street Seaport Museum maritime work shop. The largest privately owned fleet of historical vessels in the country could be found at the museum, of which she learned part of the restoration process, involving extensive research, and skill. Under the direct leadership of Master Carvers Dennis Collier Sr. and Jr., Deborah worked as part of their team of carvers on a four year project to complete the St. Thomas Episcopal Church's organ case in partner ship with Dobson Pipe Organ Builders. The Miller- Scott organ is located on 5th Avenue in Manhattan. The organ dedication ceremony is scheduled for October 2018.